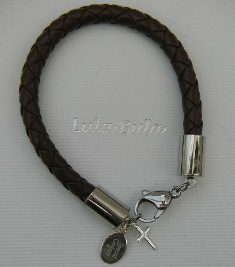 This leather bracelet is the perfect First Holy Communion gift for a special boy. The First Holy Communion bracelet measures approx 8.75" length (suitable for boy's to wear when they are older teens to adults). 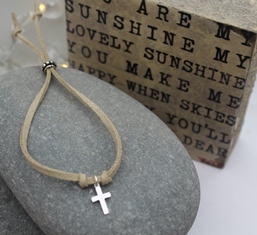 As a little extra we include a small faux suede bracelet with delicate silver cross in brown or black to match this bracelet that can be worn until the boy is old enough to wear this gorgeous leather bracelet - this is included free of charge, shown in natural faux suede colour in image. 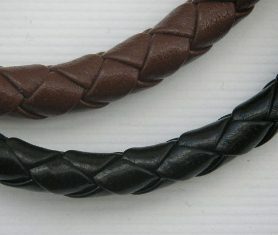 The leather bracelet is approx 0.8cm width and has stainless steel clasps, it is available in black leather or brown leather. There is a delicate sterling silver cross and a sterling silver oval tag with your choice of engraved message of your choice on our leather bracelet; 'Special Son', 'Special Godson', 'Special Grandson', 'Special Nephew', 'Special Brother''. 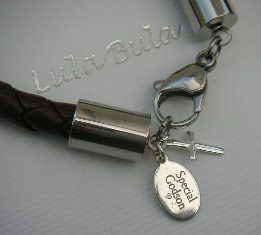 The silver tag measures approx 1cm x 0.5cm, the delicate silver cross measures approx 0.8cm x 0.4cm. Engraved First Holy Communion jewellery for boy's: We can engrave names / date / message of your choice on the back of the silver tag (maximum 40 characters). 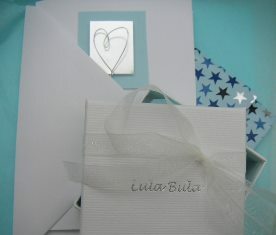 Every boy's First Holy Communion jewellery gift comes with a personalised First Holy Communion card, a little prayer book, a First Holy Communion prayer card, a gift box that can be personalised with your message, wrapping paper and ribbon.